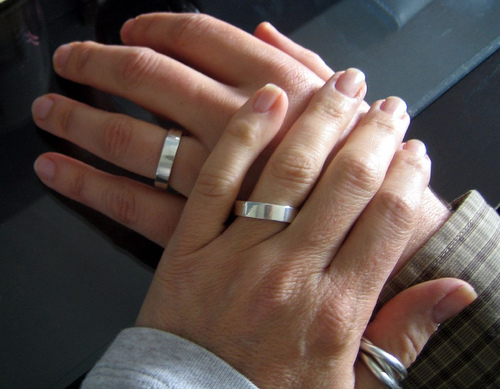 Your wedding rings represent the bond that is being created and completed between you and your significant other. The ring can be thought of as a representation of a never ending circle of love. Wedded couples keep their rings on their fingers to show everyone else that they are a part of a bond, a ring of love so deep that it cannot be broken. Since you will be wearing your wedding rings pretty much every hour of every day, it should be attractive to both you and your significant other. When selecting your wedding rings, you must consider cost, value, and style. Pick a store that is well-known for selling good quality jewelry to purchase your wedding rings. There are many jewelry stores that sell wedding rings that are a good price, but of low quality. Some wedding rings are so low quality that the diamonds will loosen and fall out of their settings. This is a more common occurrence than you think. These stores will offer you a warranty for their wedding rings, which is great, but do you want to spend the rest of your life going back to the same jewelry store to replace lost diamonds? I don't think so! Choose a wedding jewelry store that will provide you with a wedding ring that will stay intact for long periods of time, and only need maintenance once in a blue moon. They will cost you more, but it is worth the money. Let's say you went the cheap route and purchased a ring from an inexpensive jewelry store. If you calculate the gas it will take you to travel back and forth from that jewelry store every month for ten or more years, it will all balance out. Add that to the aggravation you'll experience, and the number of weeks you won't have your rings because they are being serviced, you will actually lose money compared to the cost of selecting the right wedding rings from a reputable store. Many wedding rings will have a higher price than what they are actually worth. This is how unscrupulous jewelry stores stay in business. Don't be afraid to bring your own jewelry appraiser into a store before making that purchase. You will pay for his time, but again, selecting the right wedding rings is well worth the cost involved. When selecting the right wedding rings for you and your significant other, make your choice based on your personal styles and preferences. If you prefer simple and to the point, a basic silver or gold band will do. If you are more extravagant in your tastes, choose wedding rings with more accents, diamonds, and special engravings. Selecting the right wedding rings takes time and good sense. Remember that these items will stay with you and your significant others for years to come, so be sure that you are getting the quality and style of wedding rings that you really want. I think that most couples think a lot about their wedding rings and look for the best quality they can afford as they are well aware of their symbolic significance. Wedding rings are not only made from white or yelow gold or silver nowadays, but titanium and tungstan, platinum or Palladium rings are available. Here is a chard showing the qualities of these metals.